Fred attempted to make a version of this recently but wasn’t happy with how it turned out…I’ll point him at your recipe next time. The version I made was Delia’s. Turned out a little too sweet though. Yup. I’m making this. Off to the butcher’s! Ring before you go to the butchers! I have to order beef/veal bones specially since most butchers don’t actually do their own butchery any more, it’s most cost effective to buy meat in already boned. Daft, but there you go. 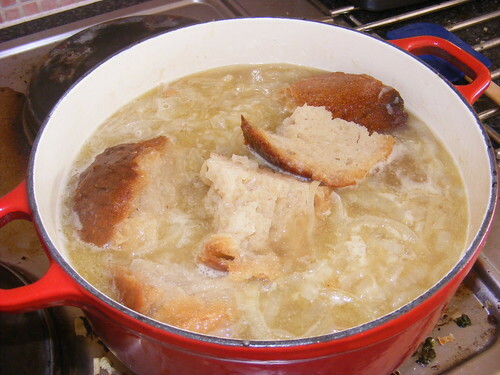 I had not seen brandy in a french onion soup recipe before, I will have to try it. One thing that I can add in the initial process of caramelizing the onions: I like to add a quater cup of water at the start and crank the heat. This wilts the onions really quickly, helping them release their own water more quickly. Once the water evaporates, reduce the heat and you will get to the golden-brown stage more quickly and with less burning. Is not trying hard enough, With a stale baguette that inspired me to look for this recipe, and between the kids and the dog and all other manner of things on my to-do liste, I chose to use the below standard stock cubes. Yes, it could have been EVEN more delicious if I had sweated over home-made stock (and sometimes I do). But I’m not trying to impress the queen, just a hungry family. 🙂 Thanks for the recipe and the tongue-in-cheek slap. From a working mum, it works! Delish. Caramelize onions in butter for like 2 hours, add beef stock and sherry and reduce, add demi glace, thyme, salt, white pepper, and white wine, reduce, ladle into individual oven safe bowls, top with crusty bread rounds and Gruyere, broil and serve…takes 3 hours at least but I’d go head to head with you bro!